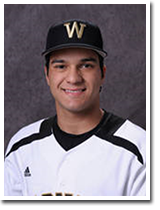 A four-year letterwinner at Western Michigan University, Theo Piccirilli is in his first season as a head coach for the Michigan Bulls (18U). Piccirilli started with the Bulls in 2009 after his junior year at St. Mary’s Prep where he was a three-time all-district, two-time all-region and all-county selection. As a senior Theo batted .402 with five home runs, 30 RBIs and 40 runs scored earning him a first team all-state selection. Piccirilli played two years of 18U Bulls for Bobby Marten and Will Tollison and another four years with Frank Gallagher’s 22U team. His best season at Western came as a junior where he played in 54 games with 52 starts. He was third on the team with a .322 batting average, second in hits with 68 and led the team in at bats and runs scored. In his senior season Theo became just the fourth Bronco to be named to the MAC All-Tournament Team. He led Western to their best tournament run in school history batting .556 with 3 walks, 2 RBI and a run scored.